SKOWHEGAN -- Helsinki. London. Vancouver. Los Angeles. Skowhegan. All have been targets of a global trend in subversive embroidery called yarn bombing -- random acts of knitting that brighten urban landscapes with colorful, knitted items attached to door handles, trees, trash receptacles and utility poles. SKOWHEGAN — Helsinki. London. Vancouver. Los Angeles. 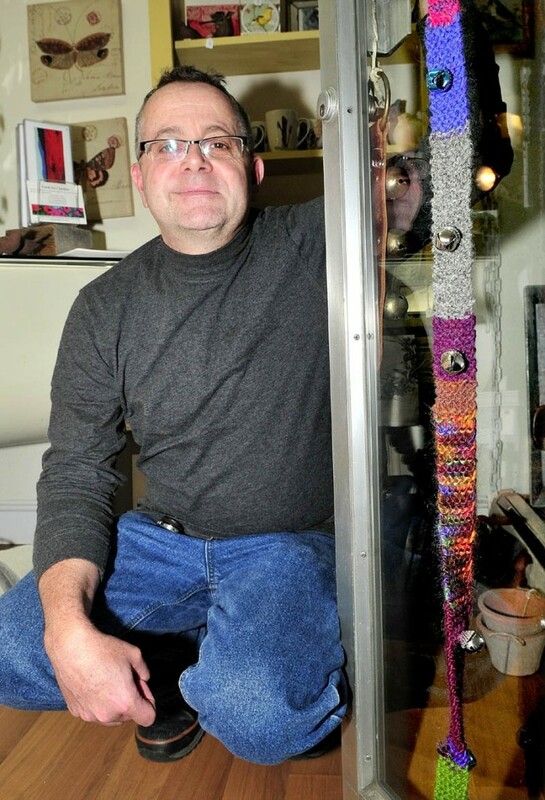 A GOOD YARN: David Ellis, owner of the Wish shop in Skowhegan, found this knitted belt of yarn and bells on the front door of his store Saturday. Twenty other town businesses were targets of "yarn bombing," where colorful yarn items are left to brighten the urban landscape. All have been targets of a global trend in subversive embroidery called yarn bombing — random acts of knitting that brighten urban landscapes with colorful, knitted items attached to door handles, trees, trash receptacles and utility poles. It’s urban weavery. Graffiti knitting. About 20 downtown business owners in Skowhegan returned to work after the weekend’s Holiday Stroll to find small knitted novelties at their doors. Since Monday, it’s become a real who done-knit, said Jennifer Olsen, executive director of Main Street Skowhegan. “It was a complete surprise to everyone in downtown,” Olsen said. “Apparently these types of activities called yarn bombing are cropping up all over communities where people who love knitting and love their community decide to go on a rampage, wantonly loving up their towns by use of their creative talents. Examples of yarn bombs or yarnstorms have been recorded since May 2004 in the Netherlands, according to one of two yarn bombing Facebook pages. In 2005, Texas knitters used their leftover and unfinished knitting projects to form a yarn bomb. The start of the movement has been attributed to a woman from Houston, who says she first got the idea when she covered the door handle of her boutique with a custom-made cozy. While other forms of graffiti may be expressive, decorative, territorial or socio-political commentary, yarn bombing was about reclaiming and personalizing sterile or cold public places, according to the Facebook page. It has since developed with groups graffiti knitting worldwide, each with their own agendas. International Yarnbombing Day was first observed on June 11 in Canada, started by Joann Matvichuk of Alberta. David Ellis, owner of the Wish gift shop on Madison Avenue said he found a three-foot long knitted belt with Christmas bells on it attached to his door. “I thought it was fun — I know there are some crazy knitting ladies around here and they all seem to have a good sense of humor,” Ellis said. As to who might be the ringleader of the guerilla knitting, Ellis said he has his ideas, but chose not to share them. “I think the mystery’s fun,” he said. Michael Hunt, co-owner of The Bankery in downtown, said he found a nice cozy on his door handle the morning after the annual Christmas parade Friday night. Julie Cooke, owner of Happyknits, a new yard shop in the Somerset Grist Mill at the old county jail, said she loves the idea of yarn bombing, but would not admit to having a role in this weekend yarn attack.